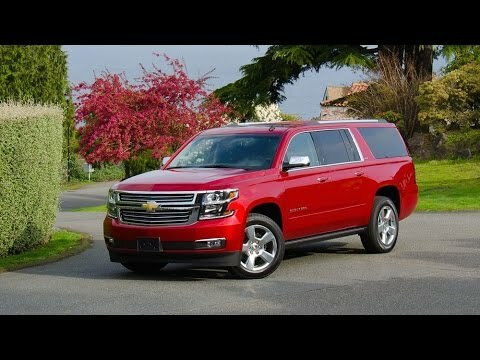 The 2015 Chevrolet Suburban is all-new this year, with fresh styling, a great new interior and more flexible seating. Throw in slightly more fuel-efficient engines, and Chevy's popular big SUV is ready to take on the suburbs, the wilderness, or anywhere in between. Check and adhere to any warnings indicated via the dash information system. Chevrolet is unparalleled in safety features that are standard with a Suburban. Safety features include but are not limited to, side mirror indicators, chair vibrates for over the line notification, parking assist with realistic vehicle and proximity to object depicted in dash, parking cameras with sound notifications and so many more. Suburban shave spacious interiors with all rear seating having the ability to fold down allowing space for cargo use of necessary. There is plenty of legroom in the rear seating areas making long road trips comfortable for all. Trunk space is more than adequate for a family of 5 luggage. This vehicle is amazing on gas which is contrary to what one may assume with a vehicle of this size. The drive is smooth rather in front or back seats. As long as maintenance is followed (oil change, tire rotation, fluids checked, inspections during routine service, maintain gas in vehicle) you should experience no significant problems. I have not experienced any major problems with this vehicle. Chevrolet suburban is an amazing vehicle! After getting new tires and the cloth seats redon with leather, we had DVD players installed in the both headrest and a dropdown one for the backseat. Having 6 kids, this vehicle is the only one that can accommodate our family. We've had no problems with the vehicle's performance and no other problems whatsoever. The only complaint would be that one of the DVD players in the headrest did not work. Having only 1 vehicle, we haven't had the time to take it back in and have it fixed. So overall, the vehicle is a great car with lots of room and total comfort. My Chevrolet Suburban is very spacious and drives smoothly. I love my Chevrolet Suburban. It has enough room for my kids, their friends and all their stuff. It rides really smooth. The only issues I have really had with it is going through tires way too much. In 3 years I have had to put 4 sets of tires on it. Also, a piece that goes on the doors, next to the windows, on every door that piece has a clip broken so when you drive it makes noise. The dealership acts like it is common but it is not a recall. My favorite feature is the my link, I can unlock or lock my doors and even start my car from my phone.